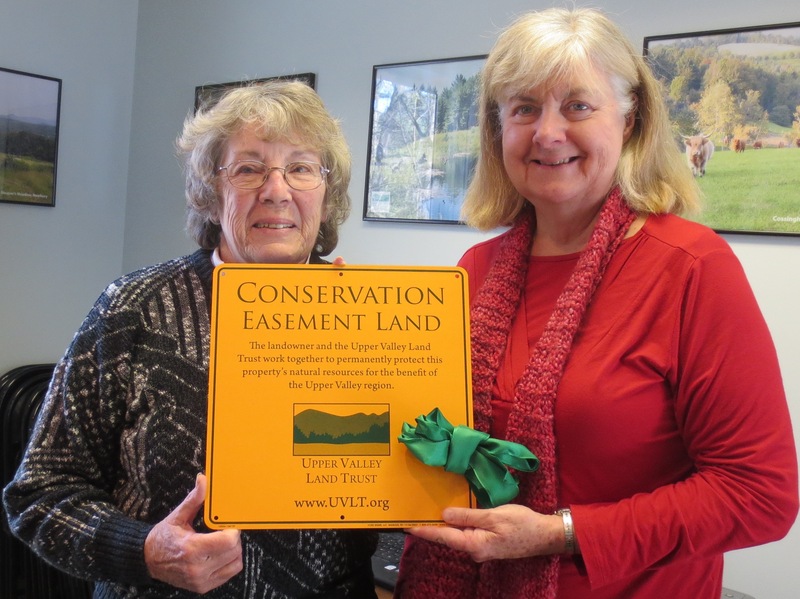 Lora Chatfield (right) and Nancy Jones hold a conserved land sign that will mark Helen’s Haven. The drafters of Vermont Senate Bill 119, a bill pertaining to the amendment of permanent conservation easement deeds, sought to establish a predictable and transparent process for land trusts, landowners, and the general public. Unfortunately, the bill they have proposed does not adequately recognize the important role of philanthropy, and the desires and expectations of conservation easement donors. UVLT has been following this bill through the Vermont legislature and has suggested several changes that are critically needed. But first, what are the problems? Land trusts make representations to donors about the way they will use and maintain conservation easement gifts.Â A reasonable person would conclude from viewing land trust websites and reading land trust materials that the execution of a conservation easement deed involves a permanent commitment from the land trust to uphold the conservation restrictions on a specific piece of property. If enacted, S. 119 will replace common law protections for donors and their heirs (post mortem easements) that exist today. The law will constrain judicial avenues that donors currently have to pursue claims of misrepresentation, fraud or abuse of trust. The changes could have a serious and chilling impact on donor confidence because landowners who donate conservation easements with the express intent of conserving their property would not be protected in the same manner as the donors of other types of restricted gifts. Moreover, there is a risk to the federal tax treatment of charitable gifts of Vermont conservation easements. In order to determine whether a particular easement gift is eligible for a tax deduction, the IRS reviews and relies on the wording of the easement itself. Thus, the wording the IRS relies on cannot be changed, and the parties must be bound to it. The current wording of S. 119 raises questions as to whether the definite language in a conservation easement will continue to be controlling in Vermont â€“ if it is not, donors of conservation easements may be denied the benefit of tax deductions for their gifts. We recommend these important changes to S. 119. We do not support the bill as presently written. Require that gifted easements specify if the donor intends for the land to be protected in perpetuity (provide opportunity for land trusts to certify that existing easements â€“ those conveyed prior to this law – were intended to be permanent). Conservation easements donated with the intention to permanently conserve specific parcels must only be amended using standards at least as rigorous as existing common law (when changed conditions on the property or surrounding properties make it impossible to accomplish the purposes of the gift, only the most minimal change needed to preserve the donor/donee purposes is permitted). The appeal period should be extended to 60 days, to protect the interests of easement donors and the role of Attorney Generalâ€™s office. If the express terms of the conservation easement deed provide that a particular amendment may only occur by means of a judicial proceeding (these are the amendments of concern to the Internal Revenue Service),Â provide that the District Environmental Court has jurisdiction and limit the courtâ€™s consideration to the criteria specified in the conservation easement. If these and some other minor changes are incorporated we would be able to support the legislation.Â More information about S.119, including testimony submitted by UVLT and others, Â has been posted by the House Judiciary Committee. Contact me to share your thoughts and learn more about UVLT’s position on this important piece of legislation.